FINALLY, THE TRUE STORY ABOUT GOD AND MAN! The New Day is the true and transformational life story of famous business entrepreneur Charles “Chuck” Curcio, known for his unique and offbeat TV commercials as the Tire King, who parlayed a 500 dollar investment into fame, fortune, and the American Dream. Then God came to him one October day and asked Charles to work for Him,with this simple instruction: “You are to learn about me and about you, and then teach others who they are too”. Although initially he resisted, Charles agreed to serve God, and from that day forward his life changed dramatically, ultimately leading him to Delphi University of Spiritual Studies and the incredible world of God and Spirit that can be accessed and experienced directly by all people. In the first part of the book, Charles details his early life and business career, how he became a successful entrepreneur, and the secrets to his success. This is a must read for any serious entrepreneur and business owner. Charles then takes the reader on his own spiritual journey and shares many of the incredible events which occurred along the way, like speaking directly with God, miraculous healings, spiritual phenomena, and the insight and understanding he has gained as a result. As only he can, Charles departs to the reader profound and yet simple spiritual truths and wisdom, articulating the way things truly are, and sharing many things most people have never heard or realized before,like the Principles of Energy, Life’s Journey, Purpose, and Plan, Eternal Life and the Myths of Death, Heaven, and Hell, the Law of Karma, the True Nature and Cause of Dis-ease,and the Spiritual Powers & Gifts You Possess. 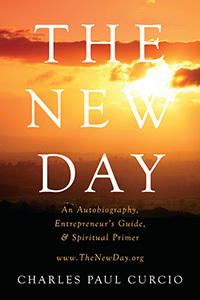 The New Day is a book about God,a Manual of Spirituality, a Spiritual Handbook and Primer in which you will learn the truth and purpose of life: where you’ve come from, where you’re headed, the spiritual gifts and abilities you possess, how you can develop and express them, and how to bring healing, harmony, and abundance into your life. Simple, straightforward, new, and revolutionary, Charles will give you a whole new understanding, depth, and perspective of who and what you really are, and what life and existence are really about. Finally, the true story of man and God, our spiritual nature and our relationship to the Universe, and the reasons we come to earth; our Purpose, Plan, and Mission. The New Day is an incredible story of Spirituality and Spiritual Awakening, Love, Miracles, Wisdom, and Spiritual truth, providing the reader with a true perspective about life, existence, life’s purpose, and the ways things truly are. A spiritual handbook and primer, and a treasure of spiritual truth and principles, The New Day will finally answer the questions man has pondered within from the beginning of time: “Who am I, What am I, and What am I doing here?” So keep an open mind and an open heart, and get ready to know the truth, the truth of life, your life’s purpose, the truth of you. 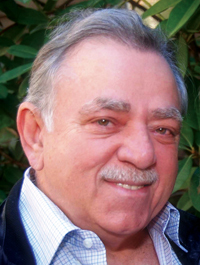 Charles Paul Curcio has been a gifted healer throughout his life. He began his spiritual studies as a young man and used these principles to become a successful entrepreneur and self-made man. Charles is the founder and former CEO of Tire Kingdom, which has now become the world's largest tire and automotive service company. In 1996 he retired from his business to devote his life fully to healing and teaching. Charles currently serves as a Director of Delphi University of Spiritual Studies in McCaysville, Georgia, where he works as an instructor and a healer, training people from all walks of life how to use their spiritual gifts and abilities in the fields of energy healing, metaphysics, psychic training, and transpersonal psychology. Charles is also the President of the Church of Wisdom and, along with his wife Kimberly, is the builder of the beautiful Temple of Wisdom Complex at Delphi University.